This page is for the various learns that I been through which may help you in your cooking adventures. Sort of a tips and tricks page. Feel free to share your experiences - I love to learn. Cheesecake has become one of the most poplar desserts in the world. Cheesecake variations has been the subject of many debates. Some love lush and creamy cheesecake, others favour the dense New York Style cheesecake (my favourite). Then there’s the light and airy variety and a myriad of crusts which range from the classic Graham cracker to Oreo cookie to brownie and cake layers. The whole subject can get a little confusing. Regardless of the type of cheesecake you prefer, here are a few secrets to baking cheesecake that Mum and I put together. - Full-fat cream cheese produces the texture and taste you're after. The fat-free kind is prone to bake up a cake that's soft, chalky and slightly rubbery inside while the low fat sort, often dubbed "Neufchatel", will yield a harder, more crumbly cheesecake. - Before you begin mixing, all ingredients are to be at room temperature, especially the cream cheese, to make mixing easier. If it's cold and hard it will make a lumpy cheesecake and if you think beating it to death will take care of those annoying bits of un-creamed cheese...think again. - To soften cream cheese place completely unwrapped packages in microwavable bowl and microwave on high 30 to 45 seconds or until slightly softened. - Also, unless the recipe instructions specifically says otherwise, you should beat the cream cheese by itself first until it’s smooth and light before you add any of the other ingredients. - Avoid over-beating the cheesecake filling. Over-beating incorporates additional air trapped inside the batter - a result of over-mixing. Once in the oven, the air bubble expands and wants to escape from the cake. As it finds its way out of the top of the cake, it creates a crack or crevice in the cake's surface. - Beat in eggs one at a time. Be sure to mix your cheesecake batter well, eliminating all possible lumps in the cream cheese BEFORE you add the eggs. It is the eggs that will hold air in the batter, so add them last, and mix as little as possible once they are in the mix. - Some recipes contain a small amount of starch, such as flour or cornstarch. These recipes will result in a cheesecake whose texture is slightly more firm and cake-like. These flour-containing cheesecakes can be baked directly on the oven rack at moderate temperatures. - Use a spring form pan (a pan with removable side and bottom) or cheesecake pan with removable base. Line tin with foil to ensure water doesn’t leak into the tin and soak the pastry. Placing the pan on a baking sheet helps avoid leaks in the oven if not using bain-marie. - Generously greasing the sides of the baking pan before pouring in batter will allow the cake to pull away from the pan as it cools and shrinks instead of pulling apart from the middle. 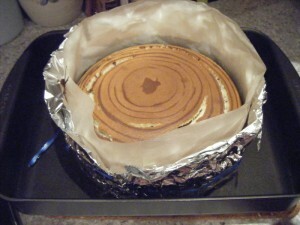 - To prevent discoloration, line the base of the tin with a disc of nonstick baking paper or greased greaseproof paper. - Also known as a water bath, produces a texture that is creamy almost custard-like, moist and rich. Cheesecakes baked in this manner are insulated from the direct dry heat of the oven. A cheesecake is similar in structure to many flourless custards and benefits from the gentle even heat a water bath can provide. - To make a water bath, you set the foil-lined cheesecake pan inside a roasting pan lined with a heavy tea-towel on the oven rack, and then pour boiling water into the roasting pan until the water is at least halfway up the sides of the cheesecake pan (but NOT spilling over the top!). - You should use a roasting pan that allows at least 5cm/2 inches of space between the edge of the cheesecake pan and the edge of the roasting pan. For example, if your cheesecake pan is 23cm/9 inches in diameter, use a roasting pan that's at least 30cm/12 inches across. Placing a heavy dishtowel in the bottom of the roasting pan before you set the cheesecake in it will protect the bottom of the cheesecake from receiving any direct heat from the oven coils. Be sure you fill the bath with boiling/hot water. If you don't start with boiling water, it will take a very long time for the water to get hot in the oven, and will throw off your baking time. Fruit is better reserved for use as a topping as its flavor can get muddled and lost in the cheesecake when baked along with it. A plain cheesecake topped with a cooled fruit compote or fresh berries glazed with melted preserves will give you a spectacular presentation as well as optimum taste. If you decide to use fruit in the cheesecake, to save it from sinking it to the bottom, dust the fruit with plain flour before putting it in the cake. Be sure its the last thing you stir/place in. - Always bake a cheesecake on the center rack of the oven. - Don't open the oven door during the first 30 to 40 minutes of baking, drafts can cause the cheesecake to fall or form cracks. - Avoid over-baking. Be aware that baking times are not always exact, due to variations in ovens. A perfectly baked cheesecake will be: Puffed around the edges and the center should be slightly moist and jiggly. - Unless otherwise directed by your recipe, turn the oven off and allow cheesecake to remain in oven, with the door ajar, for an hour or until center is completely set. This helps prevent the cheesecake from sinking in the center. After chilling the once wobbly center should firm up just fine and without the unattractive cracks that overcooking causes. - Upon removal from the oven, loosen the cake from the edge of the pan by running the tip of a knife or narrow spatula between the top edge of the cake and the side of the pan. This allows the cake to pull away freely from the pan as it cools. - Remove from the oven and cool completely on a wire rack at room temperature away from drafts before refrigerating. Place a plate or sheet of paper over the cheesecake to slow the cooling. - After a cheesecake has chilled completely, preferably overnight, you will need to refrigerate for at least another 6 hours. Gently loosen the entire side of the cheesecake from the pan with the tip of a knife while slowly releasing the spring-form pan clamp. Carefully remove the side of the pan. - For optimum flavor, serve cheesecake at room temperature. This takes about 30 minutes. - Store in the refrigerator up to 4 days, loosely covered. - Baked plain (minus topping) cheesecakes freeze well for up to 2 months. Transfer the cheesecake from its baking pan to a flat pan, such as a small pizza pan, or a cardboard circle. Place the cheesecake in the freezer, unwrapped, until the cheesecake is frozen firm. Wrap the cheesecake in a double layer of plastic wrap, then in heavy-duty foil, and label and date. - To thaw, place the cheesecake in the refrigerator overnight. Don't garnish the cheesecake with any toppings until ready to serve.